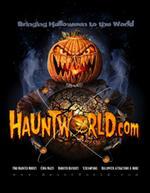 Find the best magazines for the haunted house attraction industry and or the Halloween attraction industry. Are you wanting to subscribe to a magazine that will help your business learn the tricks on how to market your haunted house, design the best scenes, learn the latest scare ideas to all the latest haunted happenings? On these pages here you will find all the publications and or websites that provide haunted house related news, articles, tips or simply advice on how to run, operate and create succesfull haunted house attractions for the Halloween industry. Do you want to find the best and scariest haunted house in the WORLD go to the home page of www.Hauntworld.com and start your search.